Intuition and an amazing backyard saw this ripe-for-a-revamp house snapped up at first sight. What is it about some dwellings that draws you in, gets under your skin and worms its way into your heart? Although it’s different for everyone, when you’re on the hunt for a home base for your family, it can often come down to a gut feeling. 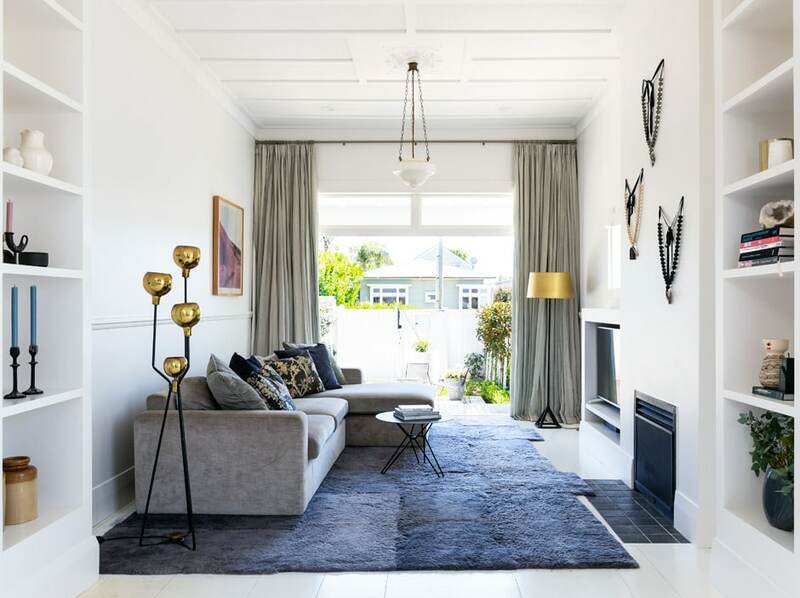 When Amy and Tim Gillespie first walked into this house in the Auckland suburb of Westmere, it instantly felt like home. 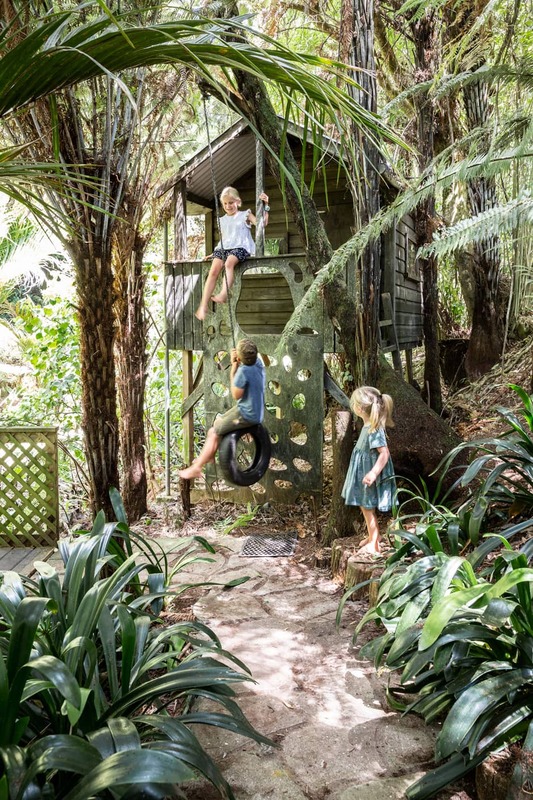 The similarity (on a grander scale) of the layout of its living and dining space to that in the house their family cherished but had outgrown immediately captured their imagination — and then they saw the back garden. Gigantic, with a gently sloping lawn, native bush and a path meandering down to a stream, it was a very exciting prospect. TOP The dining table by Ercol is decorated with a floral arrangement by Blush in a vase from Flotsam & Jetsam. It sits with cane dining chairs by Thonet on a rug from Mary Kelly Kilims. Above the bench seat custom-made by Douglas and Bec is a landscape by Nigel Brown. 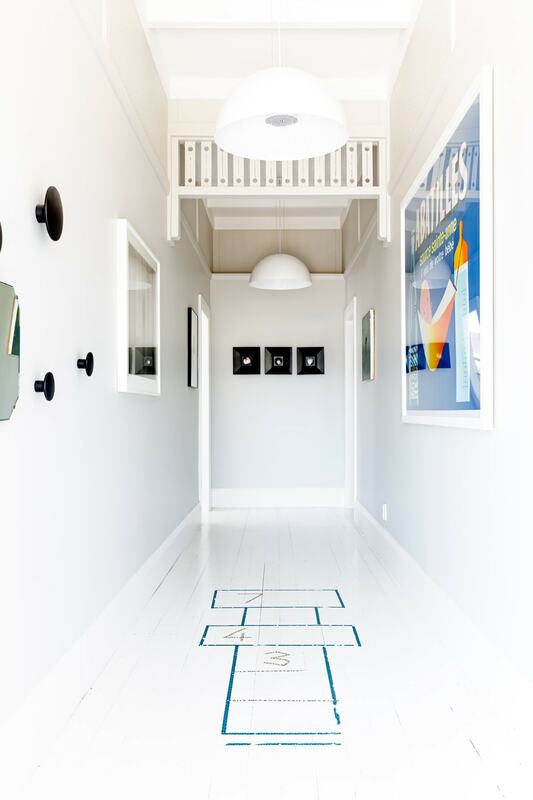 ABOVE In the hallway, a vintage French poster from Smyth Galleries sits opposite a smattering of Muuto Dots, Skygarden pendant lights by Flos hang above a hopscotch game created one rainy day on a whim, and at the farend is a trio of Lens artworks by Di Ffrench. The bedrooms also received a fresh coat — Dulux Ashville for the master, Dulux Quarter Ashville for Oscar and Florence’s room, and Dulux Green Tea for Goldie’s — as did the bathrooms, using lime-based plaster finish Rockcote Velvetina. 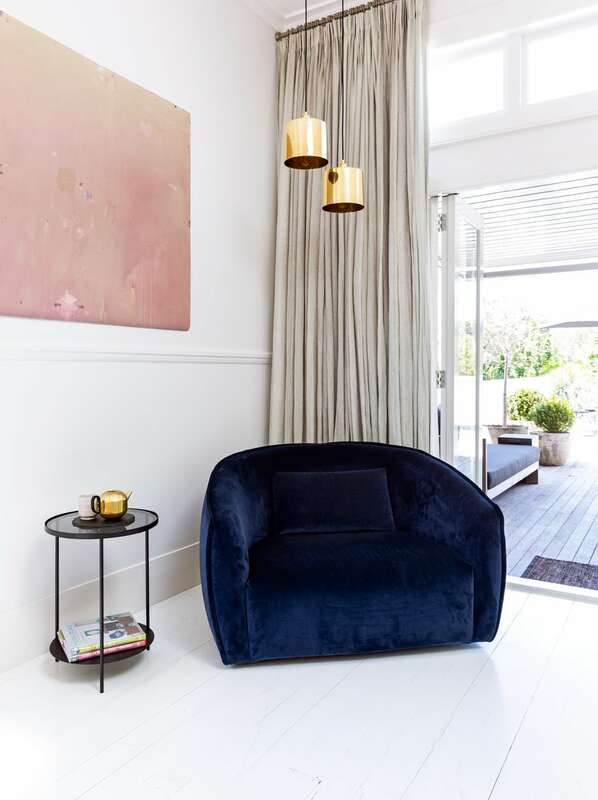 TOP Amy’s favourite Coco chair (“which has an industrial-strength swivel that lets the kids have hours of fun spinning in it”) is lit by a pair of Derry pendant lights from Murano Plus. They’re complemented by a Form teapot by Tom Dixon on a side table by Douglas and Bec, above which is an artwork by Kim Pieters. The ceramic mug is by Andrew Killick of Waihi’s Laughing Pottery. MIDDLE A tight edit of special items sits on the built-in shelves between the dining and living areas, including (from top) ceramics by Tony Sly, a curved candleholder from Everyday Needs, candlesticks from Tessuti, an artwork by Sally Austad and a pair of heirloom preserving pots that once belonged to Amy’s nana. 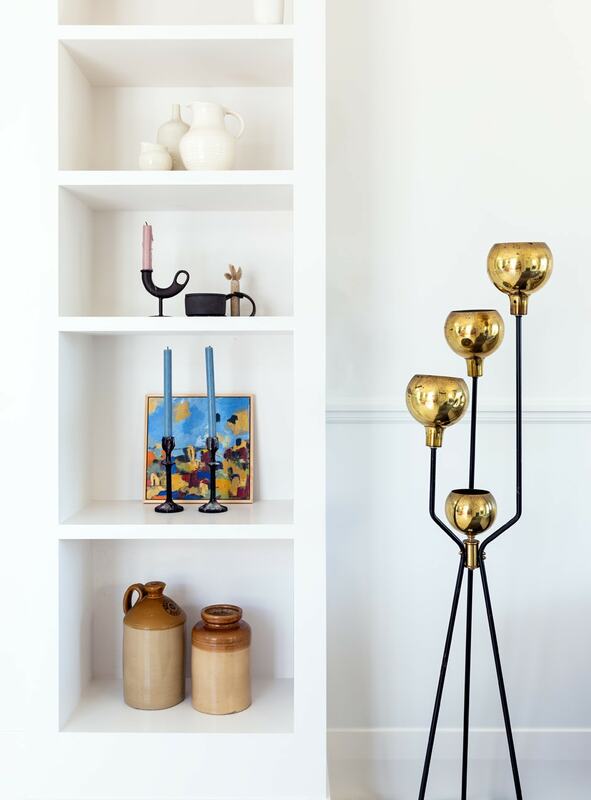 The brass floor lamp was sourced from LA by Uno Design. ABOVE Wide doors in the living area connect it to the front garden. A restored pendant, one of the home’s original fixtures, shines light on a rug by Uno Design, an artwork (left) by Danielle Thomson and prayer beads (right) by Marissa Healey of I Love Inc Studio. The Base floor lamp (top right) is by Tom Dixon. 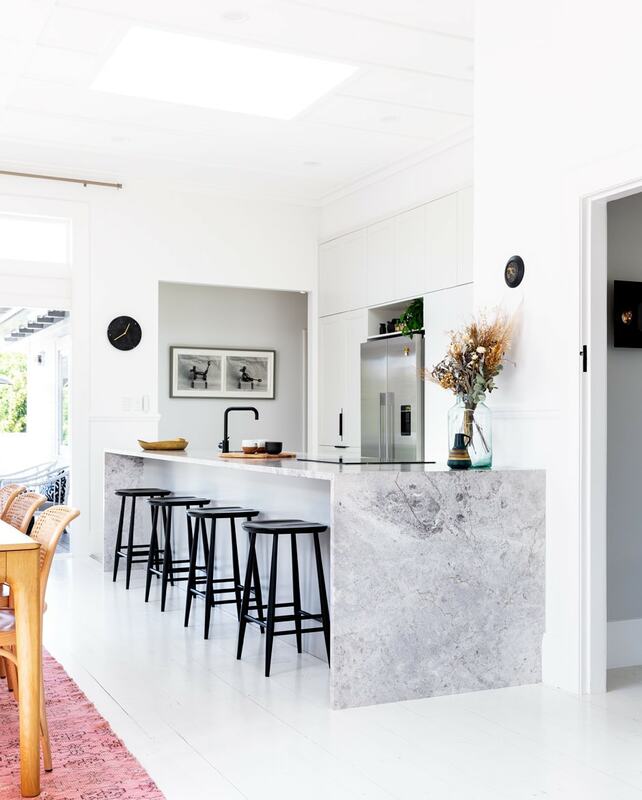 The kitchen was redesigned with a marble bench in mind. Understatedly elegant, the Italian Stone Tundra Grey material with a leathered finish is hardworking and forgiving, its soft shade offsetting its cool white surrounds. 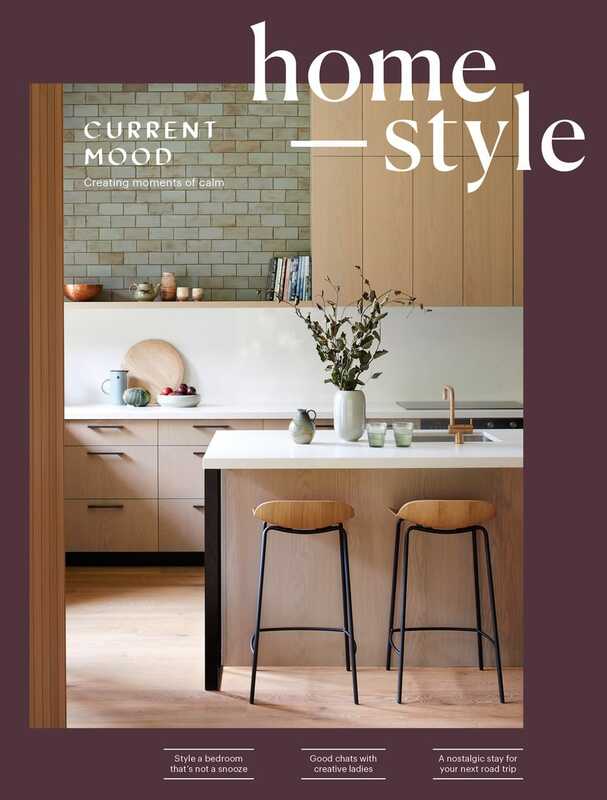 The different strengths of the wall colour tie into its hues, adding interest and depth to the cabinetry and island bench, all in keeping with the renovation’s underlying themes of serenity and harmony. 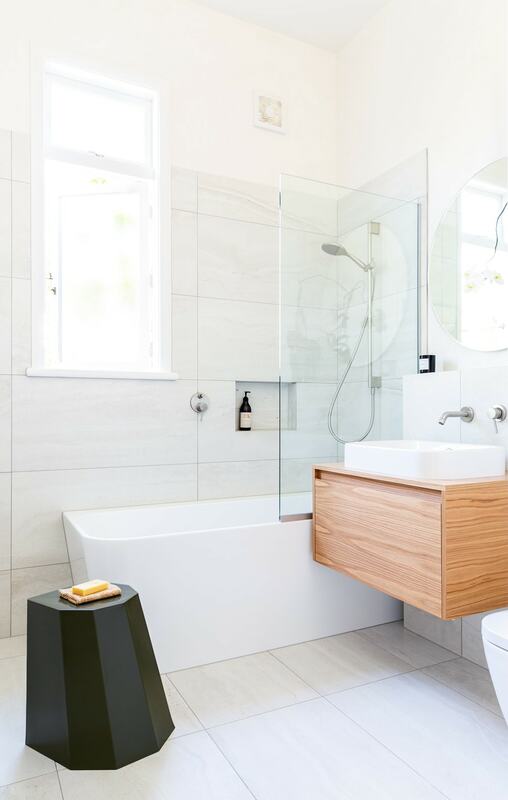 TOP Continuing the monochrome approach, an Arnold Circus stool by Martino Gamper punctuates the pale bathroom, which includes Reverso tiles from The Tile People, Paini tapware and a Happy D.2 basin from Metrix, and a Stanza Casa vanity by Progetto from Plumbline. 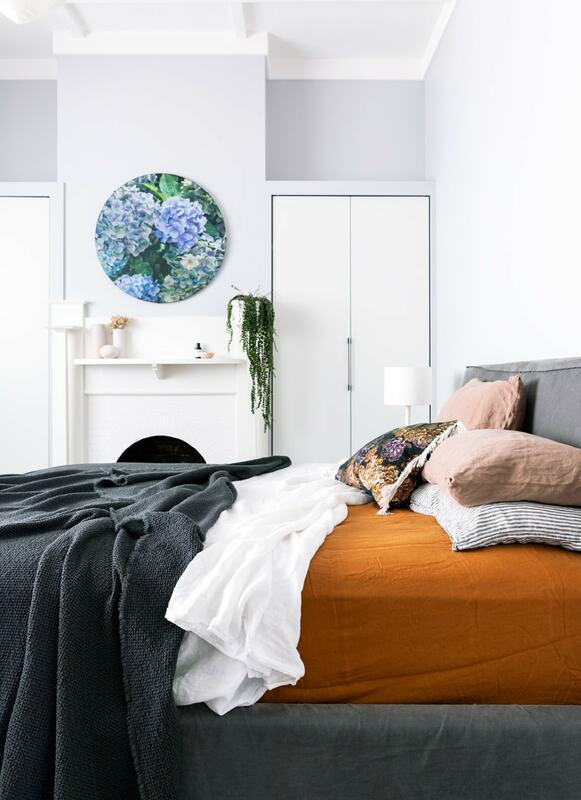 ABOVE On the Joe bed by St Clements in the master bedroom, linen sheets and pillowcases from A&C Homestore combine with a throw by Society Limonta. The artwork from The Poi Room is complemented by a Hydrangea cushion from Thread Design. 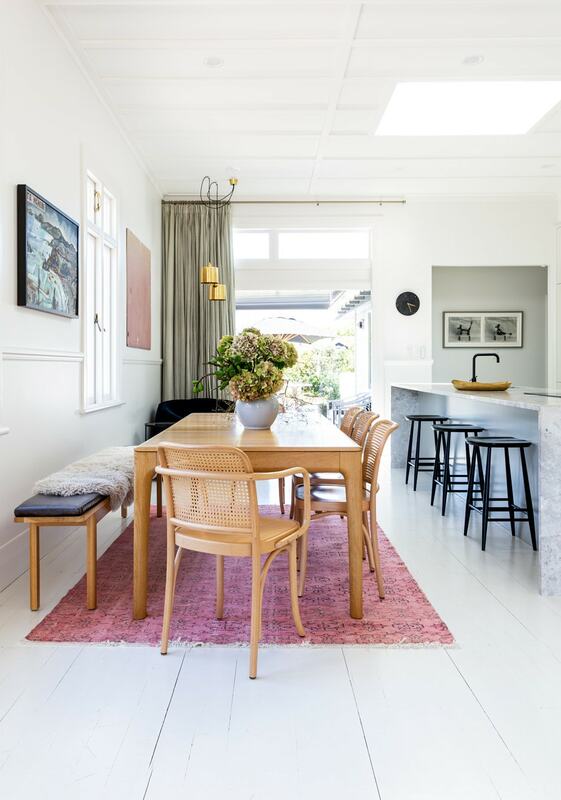 With three kids and busy jobs, creating a sense of peace was an important focus for the couple, and the art of ‘considered curation’ is also evident in their choices. Rather than being trend-driven and disposable, virtually every item is of enduring quality and special to its owners in some way. An example of this is the Ercol dining table Amy and Tim found at Mr Bigglesworthy. “We spent years looking for the right table,” says Amy.“I love that this one is wide and extendable and has a simple mid-century design. My other favourite piece is our Coco lounge chair from Uno Design. I inherited some money from my oma’s estate when she died, and I was really close to her, so I wanted to use it for something I’d have forever. I’d seen the chair in the shop window numerous times, so I rocked in there and ordered one — and Kathleen Haimes entered my life. 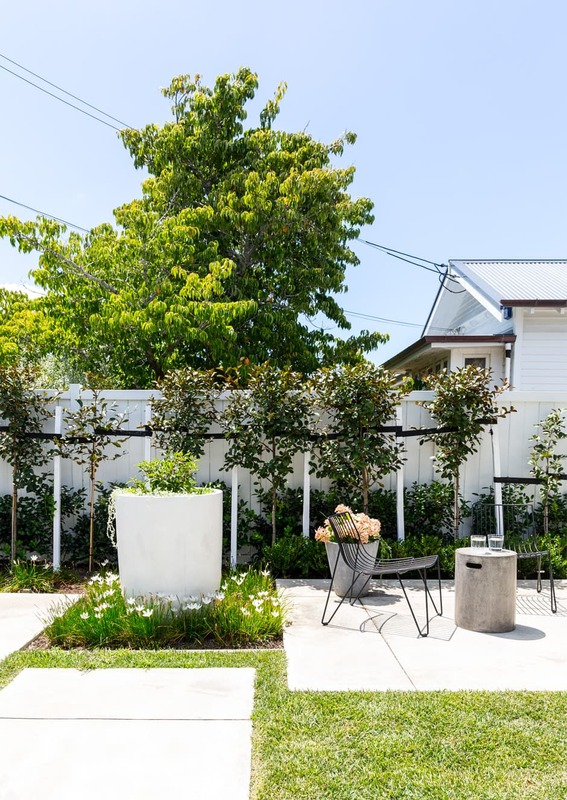 TOP The structured front garden designed by Topia Garden Design’s Brett Maclennan enjoys all-day sun. ABOVE The kids’ fort at the rear of the property was a gift from friends that was reassembled on site. The lush native bush surrounding it means they can play here for hours in the dappled shade. 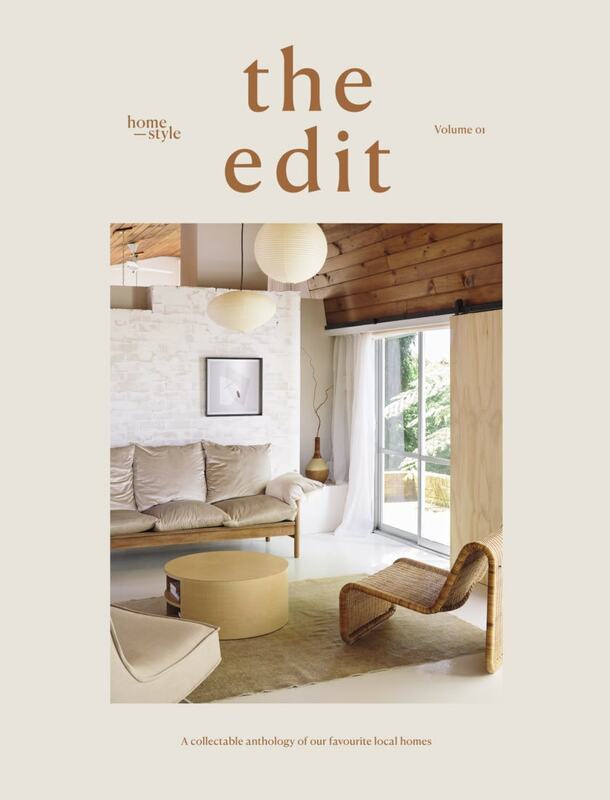 “Extremely practical and smart about the way a family home should work, but not in a cookie-cutter way”, Uno’s owner Kathleen became an integral part of Amy’s design process, supplying custom-made pieces and helping her to choose new lighting, a fabulous rug, and Amy’s favourite ’60s brass lamp, found in a shop in LA. More than simply providing their family with a beautiful home, the renovation sparked Amy’s interest in studying to become an interior designer, and she qualified last year. Ironically, as much as she and Tim champion things that will last a lifetime and adore living in this home they’ve made their own, change, as we know, is the only constant. After five happy years here, the promise of even more space has lead them to make a tough decision — to move to Hawke’s Bay, near to where they both grew up. For their next home, rather than renovating, they plan to start from scratch, and see where their intuition leads them.